1Lt Harlan J. Johnson (P) - First two missions (142, 146) flown as CoPilot with combat orientation Pilots - 1Lt Joe R. Worthley and 2Lt Charles M. Hall. 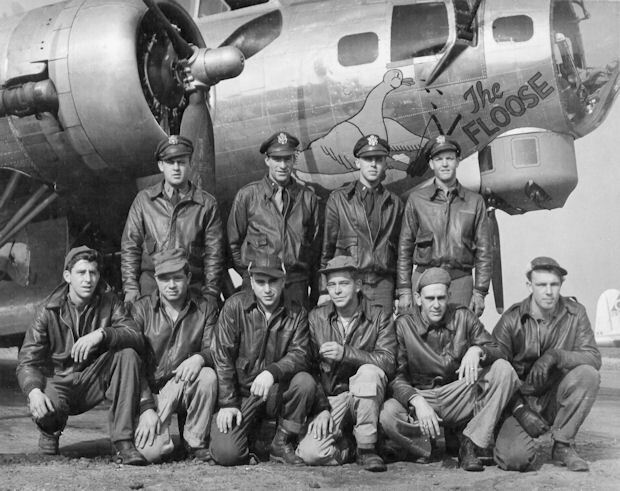 Other crew members, except 2Lt Charles E. Wright (CP), flew on mission 146 but not on mission 142. Completed 32 credited combat missions. Last mission on 17 July 1944 (mission 205). 1Lt Charles E. Wright (CP)(KIS) - Flew on 34 credited combat missions: With 1Lt Johnson (All 1Lt Johnson missions except for missions 142 & 146 where he stood down; With other Pilots (5 missions - 106, 148, 223, 227); As First Pilot (1 mission - 220). 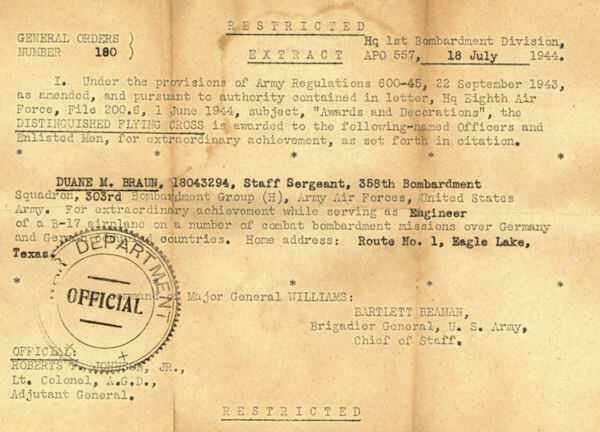 Last mission flown on 13 Aug 1944 (Mission 227). 1Lt Charles E. Wright and 1Lt Telesphor Lojewski (358th BS Philip O. Benham Crew), both CoPilots who had completed their combat tours, were killed on 1 Sept 1944. Both had transferred to the Eighth Air Force P-51 Scouting Force Unit at Steeple Morden. They were flying in an AT-6 single engine trainer aircraft from Steeple Morden to Molesworth. Their aircraft had an engine failure and while in a steep bank, to line up with an open field, a wing hit the ground and cartwheeled. Both Pilots were killed in the crash. 2Lt Bruce B. Hamilton (N) - Flew on 31 credited combat missions: With 1Lt Johnson (All of 1Lt Johnson missions except for mission 142 where he stood down). Last mission on 17 July 1944 (Mission 205). 2Lt William B. Oyler (B) - Flew on 21 credited missions with 1Lt Johnson (1Lt Johnson missions 146 thru 182); With other Pilots - None. Last mission on 16 June 1942 (Mission 182). S/Sgt Duane M. Braun (E), Sgt William Ralph George (WG), Sgt Frederick Buddingh (TG) - Flew on 32 credited combat missions: With 1Lt Johnson (All of 1Lt Johnson missions except for mission 142 where they stood down); With other F/O Costa Markos (1 mission - 210). Last mission on 23 July 1944 (Mission 210). T/Sgt Edwin H. Berrier (R) - Flew on 20 credited combat missions; With 1Lt Johnson (14 credited missions - 146, 148, 151, 152, 153, 157, 159, 160, 161, 164, 199, 200, 204, 205); With other Pilots (6 missions - 210, 211, 225, 226, 227, 131). Last mission on 24 Aug 1944 (Mission 231). Sgt Joseph Ciglar (WG) - Flew on 31 credited combat missions: With 1Lt Johnson (28 credited missions - All of 1Lt Johnson missions except for 142, 195, 196, 197); With other Pilots (3 missions - 196, 210, 211. Last mission on 24 July 1944 (Mission 211). Sgt Robert L. Stidham (WG/Tog) - Flew on 31 credited combat missions: With 1Lt Johnson (29 credited missions - All of Lt Johnson missions except for 142, 193, 194). Seven Missions (196, 197, 198, 199, 200, 204, 205) flown as Togglier; With other Pilots (3 missions - 210, 211, 215). Last mission on 31 July 1944 (Mission 215).